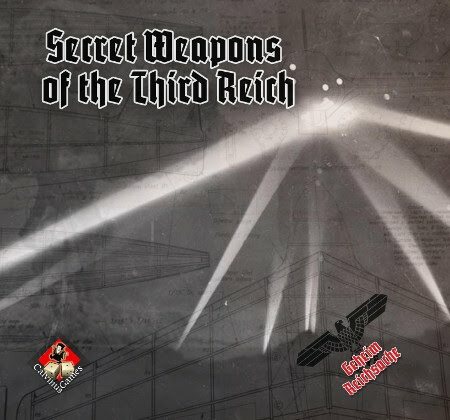 Secret Weapons of the Third Reich is a semi-cooperative and semi-competitive worker placement game simulating the arms race of Nazi Germany during World War II, designed for all fans of science fiction and alternate history. Players will discover and recreate what is hidden behind the weird allegiations and incredible tales on Nazi technology: from the secret submarine bases in Greenland to the mysterious Base 211 in Neuschwabenland, Antarctica, from the famous V-1 buzz bombs and V-2 rockets to the unlikely flying saucers derived from the work of Nikola Tesla, and so on to the German Nuclear Plan or even the unbelievable orbital solar gun conceived by Hermann Oberth! It seems a very nice and original game! Can it be played with friends in coop mode against the Allies/USSR? Yes, players take the role of research teams. Their purpose is to deliver the research of wonder weapons to the final stage of development and then to start the mass production. The game-play is semi-cooperative and semi-competitive: each player competes with his opponents to achieve the best results, but must co-operate at the same time because all players have a common goal (win or delay the war). The Allies and Soviets are not represented "directly" as the enemy to fight, but are "inside" the mechanics of the game. In fact, players must operate in a "state of warfare", that means that as time goes on they are more and more subject to enemy bombardments that can cause a great loss of resources and technologies, and, as starting in 1943, Allied and Soviet advances on Berlin force players to face progressively increasing logistical issues. calvinus wrote: The game-play is semi-cooperative and semi-competitive: each player competes with his opponents to achieve the best results, but must co-operate at the same time because all players have a common goal (win or delay the war). I wonder why there's so few games like that, those semi- give the better of both worlds. I remember playing Space Crusade, it was not in the rules, but as a SpaceMarine squad leader, we could 'lose bullets' on our winning mates, but it was giving point for the Chaos side. Too, with added rule (it added a second player for the Chaos, rules by Croc, french boardgame dev', rule found in an old CasusBelli 'zine), we could play with 5 players (3 SMarines, 2 Chaos instead of 1), so the Chaos could too bring chaos in its side if he is winning. So, like Chaos in SCrusade, it could be interesting to add the enemy sides (Allied and Soviets players) in a big expansion of the game. Or maybe first make the reverse game of SWotTR: a 2 players game where jetpack Allied infantry and cluncky Soviet mechas compete (can help or make some small treasons) to rush Germany. Then the game mixing both, team vs team, with still only one true winner, in the winning team. ERISS wrote: ...So, like Chaos in SCrusade, it could be interesting to add the enemy sides (Allied and Soviets players) in a big expansion of the game.